Mk1 Capri 1600GT XLR Pre-facelift “early” model with BBEG VIN First registered Feb 1969 (built Jan 1969) 33,040 miles 2 previous owners Excellent restored condition Brilliant mechanically Original chrome, glass & interior Fresh MOT & inspection carried out 23/3/19 with no issues After 3 years of ownership I have taken the difficult decision to sell RHO. Apart from attending numerous car shows in the UK, RHO has been used sparingly and dry-stored between use with only 500 miles dry weather driving since I bought the car in 2016 from only its second owner. 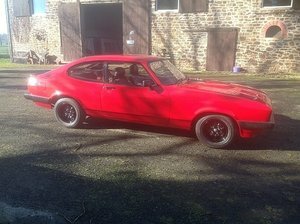 The car is known to the Mk1 Capri Register and Mk1 Capri Owners Club and underwent a major restoration between 2008 and 2011. It passed it’s MOT with flying colours again on 23/3/19 and had a full health check carried out by John Kelly Autos in Alperton, an expert in this model and the mechanical custodian of RHO during my ownership. In my time I've replaced all door and boot seals, overhauled the suspension with new shocks, springs & polyurethane bushings, kept the paintwork in excellent condition, replaced window chrome trim inserts, added period-correct plates, installed an electric Ford-embossed electric aerial, carried out an alternator conversion with period Shield rubber battery, installed a new oil pump, filter & oil last April and generally kept everything in tip-top condition. All original parts included in the sale, such as the shocks with top mounts unique to this "early" model, thinner anti-roll bar, etc. should the new owner wish to return to totally standard condition. The classy Ermine white paintwork is still in excellent condition throughout as is the brightwork, with only minor blemishes to be found. Unfortunately I only have recent MOTs and limited previous history due to the previous owner losing much of the files, but what I do have is a catalogue of restoration photos carried out by a father & son team, as well as receipts for work carried out over the last 10 years. Over RHO’s 50 years there have been just three owners including me, with the first owner for 37 of those years. This is one of THE oldest surviving Mk1 Capri driving on UK roads today and with an event-packed year lined up in 2019 to mark 50 years of the model, this particular car is bound to draw plenty of positive attention. This car is brilliant to drive and turns heads wherever you go. It’s a challenge at every petrol station to avoid the “I had/my dad had a Capri” conversations. RHO is not concours as she was restored and maintained to be driven and enjoyed, however I’ve spent a couple of thousand pounds over the last few years improving little issues I wasn’t happy with and you’ll struggle to find a better looker or driver in this price range. Things I haven’t yet got around to completing are a re-trim of the drivers’ seat base and possibly a mild restoration of the underside to remove much of the black underseal that has been applied to protect the car, intended by the previous owner to be used as a daily driver. ***Note*** this is NOT covering up any rust issues as you will see from the restoration photos and upon inspection; it's purely a preference that I would like a factory white underside finish. Phone, WhatsApp or email me for more photos and history. Car can be viewed in West London. Please don’t come to view with expectations of a concours car; view with the expectation of finding a beautiful, fun car in great condition, ready to be enjoyed. Happy to consider sensible and fair offers in the region of £14-15k. Thanks for looking. Please don't ring to insult me and challenge my "authority" to own and sell such a car; I'm a genuine enthusiast and private seller with a genuine reason for sale and no desire to profit from the sale!